EPIC Long Island believes that with education comes understanding and acceptance. As part of the ongoing Community Education and Outreach programs, the Foundation seeks to communicate with all persons who have seizure disorders. The Foundation also strives to educate teachers, health care professionals, corporations and industry, as well as the general public, about the causes, treatment and consequences of epilepsy and the proper first aid response to seizures. The Foundation promotes inclusion and assists in the mission to eliminate stigma in the workplace, schools and community at large. The Seizure Smart Program: Reaches out to school staff in an effort to combat the stigma and misinformation surrounding epilepsy. Teachers will learn to recognize the three most common types of seizures and how to respond effectively to a child having a seizure. Our Educator can come to your school and provide your staff with a comprehensive training that will empower them to understand and manage seizures in the classroom. Take Charge of the Facts Program: Teaches students in middle and high school health classes about epilepsy and seizures, causes and treatment, and first-aid procedures in the hopes of dispelling some of the myths and misconceptions that still exist. Kids on the Block: The “Kids on the Block” is an internationally acclaimed program bringing a creative approach to public education. Since the 1980’s, over one million children and adults have learned about epilepsy through the valuable and entertaining FREE educational program. 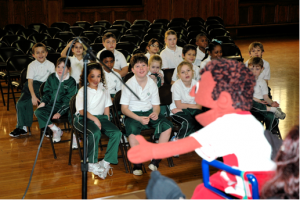 We use the “Kids on the Block” puppets, a troupe of life-size able and disabled puppets to dispel some of the myths and misconceptions that surround epilepsy. School Nurse Workshop: Comprehensive training held twice annually in Nassau & Suffolk County whereby school nurses can gain valuable epilepsy knowledge and earn 3.2 CEU credits provided by the Centers for Disease Control. This training is also available on-line. (A small fee may apply to cover cost of materials). Medical & Legal Referrals: Referrals to medical facilities and physicians specializing in epilepsy are available as well as referrals to other outside agencies for legal issues, disability benefits, educational and employment rights. Information Services: Foundation employees are available to answer questions regarding epilepsy and its treatment. Printed material including articles and brochures are also available upon request. The Foundation also houses an extensive library of books and audio visual material available to be borrowed via mail or pick up. The Sheila and Fred Abrams Community Education Workshop Series: Guest speakers provide a series of monthly educational workshops on epilepsy and epilepsy-related topics. These workshops are open to the public. Seizure Awareness and Training for First Responders: A CECBEMS- approved CE lesson will award 1.5 hours of continuing education credit upon successful completion. Seizure Awareness and First Aid Training for Direct Care Staff: Our Community Educators are available to provide training to staff at camps, day care centers, nursing homes, assisted living facilities, home health care agencies, human service agencies, or for any organization requesting it. Home Visits – Our Community Educators can provide epilepsy information sessions for the caregivers, families and loved ones of individuals with epilepsy. School Advocacy – Our Community Educators can provide support by accompanying parents at their School Committee Meetings. Employment Advocacy: Our Community Educators can assist individuals by advocating with employers and helping them to understanding epilepsy in the workplace. EPIC Youth Council: For teens and young adults who would like to work together to eliminate stigma and advocate for epilepsy awareness through youth oriented projects and programs. An 8-week art therapy program for individuals, age 16 and older, living with epilepsy. Participants will work with an art therapist in a group setting to create artistic pieces using a variety of media, strengthen their artistic voice, and learn from others in a safe and welcoming environment. Sessions take place in both Nassau and Suffolk Counties.